Indonesia’s status as an archipelagic country has been established since the Djuanda Declaration in 1957 and reinforced by the United Nations Convention on the Law of the Sea (UNCLOS). Indonesia has about 17,500 islands, along 81,000 km of coastline. Approximately 62% of Indonesia’s land area is sea and waters, this is confirmed from the CTF data, the land area of 1.91 million km2 while the area of water reaches 6.32 million km2. With such natural conditions, Indonesia became a marine country with a variety of tremendous potential. Here are the facts about Indonesian marine. Ocean Thermal Energy Conversion (OTEC) Indonesia is the largest in the world. It is spread over 17 locations in Indonesia. OTEC is part of renewable energy sourced from the difference in seawater temperature that is easily found in tropical marine waters. The potential of marine heat energy in all Indonesian waters is totally predicted to generate power around 240 GW. This energy will generate electricity and pure water due to sea water evaporation. As a maritime country with a vast sea area, as well as hundreds of dive tourism destinations spread from Sabang to Merauke, Indonesia has been named the best destination for readers of a travel magazine in the world’s best diving destination category, in London, England in 2017. In this competition Indonesia beating rivals such as the Philippines, Azires, Mexico, Maldives, Egypt, the Bahamas, Thailand, Fiji and Papua New Guinea. The World Food Agency (FAO) in 2014 declared Indonesia to be the second largest country of capture fishery production of 6 million tons in 2014. The first rank is occupied by China with production capability reaching 14 million tons. Indonesia becomes the second country with the highest level of diversity in the world. Perhaps it would be higher than Brazil if all the biological resources on the ground and on the ground had been explored all. The title is reasonable considering Indonesia lies between two continents of Asia and Australia; and two oceans namely the Pacific Ocean and Indian Ocean; as well as the form of an archipelagic country with its tropical climate. Unfortunately Indonesia turned out to be the second largest contributor of waste in the world, amounting to 187.2 million tons, after China in the first rank with the volume of waste reached 262.9 million tons. The third order of Philippines is 83.4 million tons, Vietnam next is 55.9 million tons, and Sri Lanka is 14.6 million tons per year. Indonesia was also hit with many coastal reclamation issues that in fact damaged the marine environment and life in it, such as Tanjung Benoa Bali, Jakarta Bay, Manado Beach, and other places. The problem is sually in around social and politic issues. Allowable catch from Indonesian seafood reaches 5.2 million tons per year, equivalent to 7.2 trillion rupiah. Not surprisingly, 57-60 percent of animal protein intake of Indonesian people comes from the sea. So make Indonesia as a supplier of 10 percent of fisheries in the world. Indonesian marine is an important lane and habitat for the world’s marine mammals. Of the approximately 87 species of marine mammals in the world, as many as 32 types of marine mammals from groups of whales, dolphins and dugongs can be found in Indonesia, including the Blue Whale (Balaenoptera musculus) which is currently endangered under the IUCN Redlist category. The Indonesian marine has the largest coral reef habitat in the world. Indonesia’s coral reefs reach 70 thousand sq km or about 18% of the world’s coral reefs. 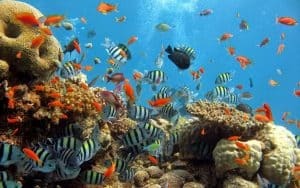 Of 132 species of economically valuable fish in Indonesia, 32 of them live on coral reefs and healthy coral reefs (in a seascape area) can produce 3-10 tons of fish per square kilometer per year. The Indonesian Ocean comprises an archipelagic territorial archipelago, territorial and an exclusive economic zone of 5.8 million sq km and is supported by a coral reef biodiversity and mangrove is a national fish food donation that accounts for about 57-60% of animal protein intake for the Indonesian people . In Indonesia, there are many coral reefs. At the famous Indonesian coral reefs are in Bunaken and Raja Ampat. Indonesia’s coral reef is about 51 thousand km2 or about 18 percent of the total coral reefs of the world. The total area of the Indonesian sea is its vast ocean of 5,076,800 square kilometers of land area of 1,904,569 square kilometers. That means 2/3 part of Indonesia is the ocean. Therefore, Indonesia is often called maritime state and archipelago country. Indonesia’s coastline reaches 99,093 kilometers based on data from Indonesia Geospatial Information Agency. This length puts Indonesia as the country with the longest coastline in the world after Canada. Indonesia is also the center of life for elasmobranch species or soft boned fish such as sharks and rays. There are 596 species of sharks and rays, 157 of which are in Indonesia. Among the hundreds of species, the Whale Shark (Rhicodon typus) as the largest fish species in the world and Pari Manta (Manta birostris) as the largest stingray species in the world are in Indonesia. Both are known to breed in areas of Papua such as Raja Ampat. The seabed of Indonesia holds thousands of minerals. Starting from oil, precious metals, iron and the like. Although many contain minerals and minerals, the utilization of minerals in Indonseia is still very minimal and very few are aware of it. Most of the existing mining materials submitted by foreign parties. Moreover, the water transportation in Indonesian are also great. It could be the support for the development of Indonesian mineral resource hunting. Those are the facts of Indonesian marina that you have never imagined. As Indonesians you shoud be proud of it since Indonesia is a rich country.